When 2-year-old Roman Dinkel‘s parents went in for mom Whitney’s 20-week ultrasound during her pregnancy, the couple had expected nothing more than an update on their son’s growth and measurements. Instead, they were given the shocking news that Roman would be born with spina bifida, a birth defect that occurs when a baby’s spine fails to develop or close properly while in utero. In Roman’s case, extra fluid on his brain and spine were likely to leave him unable to ever walk. 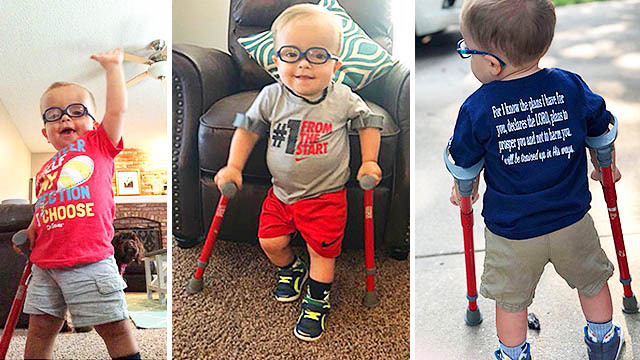 But thanks to a surgery performed right after he was born, his parents were hopeful that he would defy the odds—and he inspired millions worldwide when he did just that. His parents shared a video of the moment he was able to walk using special arm crutches his physical therapist brought over for him, delightedly informing the family’s dog of what he was doing. Mom Whitney got the idea for the arm crutches late one night, texting Roman’s therapist and giving him the option to try them out the very next day. In a perfect example of just how powerful representation can be in children’s programming, the toddler immediately fell in love with the crutches, thanks to character Chrissy from the show “Daniel Tiger“—who also walks with arm crutches. The video Roman’s parents shared was initially just a chance for the family to include others in their excitement over the momentous milestone, but the reaction they’ve gotten from the internet has helped them realize just how inspirational his success has been. “From random people telling us their story, you know, how they were depressed, or you know, how they were suicidal, or how they were going through these medical situations and to see that he influenced them in a positive way to change their mindset and change their view it’s just so heartwarming,” Whitney shared. It’s game day!! Go Chiefs!